The Green New Deal has mostly been an idea floating around the minds of lawmakers. In short, it’s supposed to transition the U.S. to a clean energy economy that’d create an entirely new job market, save us from climate change, and protect public health all while remaining equitable toward low-income families and communities of color. Rep. Alexandria Ocasio-Cortez, who represents one of New York’s most forgotten districts, has spearheaded efforts to get her fellow legislators and the public thinking about a Green New Deal. Apparently, Cuomo has been listening. His announcement—the first state-level proposal that frames itself as a Green New Deal—is in line with the state-wide goal to go 100 percent renewable by 2040, but it’s far from perfect. The announcement makes it clear Cuomo hopes to revolutionize the state’s transportation, building, and electric sectors. This means ramping up offshore wind energy production to 9,000 megawatts by 2035 and funding energy storage projects, per the Institute for Energy Economics and Financial Analysis. It also means a $10 billion investment in clean water infrastructure, renewables, clean transportation, and climate resiliency, as well as a $70 million property tax fund to help leave dirty energy behind and support people who live near power plants, reports Grist. 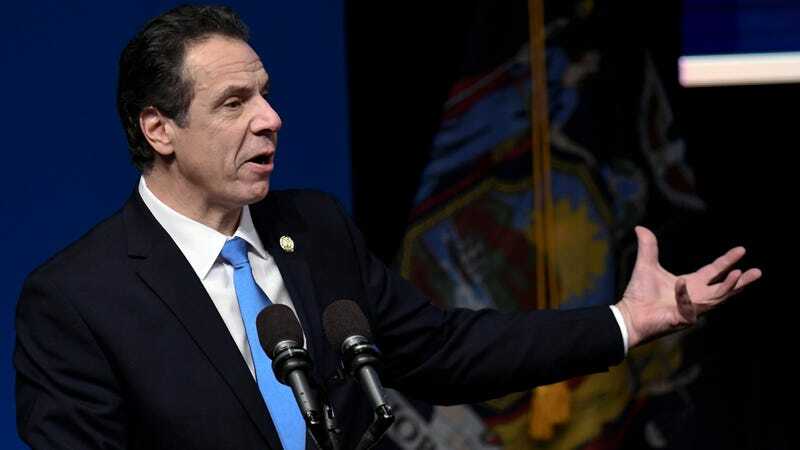 To achieve all this in a way that prioritizes “low- and moderate-income New Yorkers,” the state is creating a Climate Action Council that’d bring together state officials, environmental justice leaders, and clean energy experts, reports E&E News. These proposals underscore just how quickly the idea of rapid, justice-centric transition off fossil fuels is being embraced by mainstream progressives. And it’s possible more states will follow New York’s lead: After all, hundreds of local and state officials have already voiced support for a Green New Deal. So have more than 600 environmental groups. Still, not everyone is fully embracing Cuomo’s vision. New York Renews, a coalition of more than 150 organizations, was pleased to see some action to convert the state fossil-fuel free, but it’s more excited about the Climate and Community Protection Act, which it describes as a more aggressive policy toward achieving an equitable clean energy economy. The group’s been pushing for this bill for three legislative sessions now and was disappointed to not see it included in the budget. The Sunrise Movement, a youth-led organization that helped shine a spotlight on the Green New Deal, also wanted to see the governor incorporate that bill into law, “which invests directly into environmental justice communities and sets a concrete timeline for moving the whole [New York] economy off fossil fuels,” as Executive Director Varshini Prakash wrote in an email to Earther. “Andrew Cuomo obviously knows a political winner when he sees one, but until he rejects fossil fuel money and commits to backing the full vision of the Green New Deal, young people are right to be skeptical,” she went on. Other people, however, just don’t think this Green New Deal goes far enough. Regardless, Cuomo’s decision is a big deal for proponents of a Green New Deal. The legislature must still approve the budget to enact it into law, but the proposal is normalizing the Green New Deal’s potential and showing what such a deal can look like. And this is just one example; future versions of the Green New Deals may go even further. Update 1:38 p.m. ET: This post has been updated to include comment from the Sunrise Movement.